Our Kimberbell event is a great way to have fun and get to know machine embroidery. This event is suitable for the beginner all the way to the most advanced embroiderer. In this event you will learn: single-hoop embroidery on a ready-made article, multi-hooping, piecing in the hoop, how to install a zipper, embroider a quilted design and so much more. During the 2 days, you will make and finish 6 embroidery projects all in the hoop. 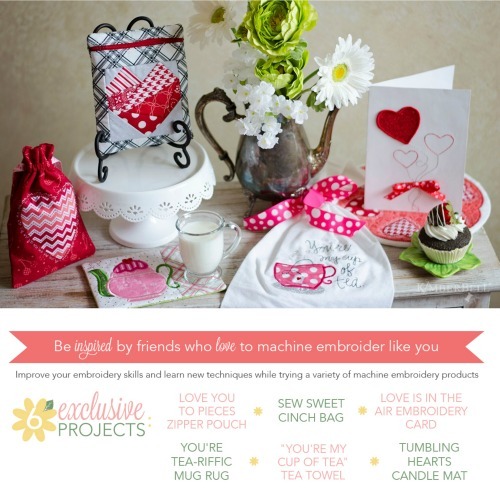 Included with your Kimberbell event, you'll receive an exclusive sewing bag completely filled with Kimberbell fabric, paper tape, ribbon, buttons, and more to make six amazing event projects. We'll even cut the stabilizer for you! You just need to come with your machine and a few basic supplies and be ready to have fun. We will even provide lunch. IMPORTANT UPDATE: WE WILL BE PROVIDING MACHINES FOR THIS EVENT! IF YOU ALREADY PLANNED TO BRING YOUR MACHINE, GREAT! JUST LET US KNOW. IF NOT, WE WILL BE PROVIDING (AT NO ADDITIONAL CHARGE) A MACHINE FOR YOU TO USE. WE HAVE ALSO EXTENDED THE EARLY BIRD DISCOUNTED PRICE UNTIL MAY 1ST. First, remember that this event is Friday (May 10th) and Saturday (May 11th). The hours for the event are 9:30 to 4:30. Doors will NOT open before 9:00 AM. If you want, there will be coffee, pastries and more before the event so you may want to come a little early (do NOT show up PLEASE before 9:00). Second, we always get asked, "What do I need to bring?". To try and keep the cost down for this event, we are asking attendees to bring your embroidery machine, embroidery hoop (it needs to be capable of a 6 in x 10 in embroidery or larger), cord, embroidery bobbin case. All the supplies for the projects will be supplied. Third, there will be LOTS of items for purchase (basically everything Kimberbell sells). We will be able to handle all forms of payment. We will also be offering financing (1 year No interest) for those of you that want it. If you have an existing Synchrony/GE account, try to bring your card or something with your account number (it will greatly help in speeding up the checkout process). Since we want everyone to come to the right location, please remember that this event is being held in the Community Room at the Eagleville Fire Department (we have held all of our other large events there). The address for the Fire House (for all of you with GPS systems) is 879 Stafford Rd (Rt 32) in Storrs.